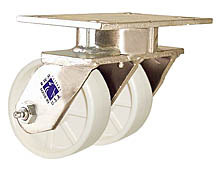 Mounting Plate: 4" x 4-1/2" x 1/4"
Bolt Hole Spacing: 2-5/8" x 3-5/8", slotted to 3" x 3"
Solid Urethane Wheels are used primarily for applications involving high moisture. Injection-molded urethane, this wheel provides extended service in moisture applications that normally destroy conventionally bonded wheels. The standard durometer of RWM urethane solid wheels is 75 on the Shore D scale. Sealed precision ball bearings are recommended for maximum rolling ease with no maintenance lubrication required. They provide quiet operation for medium duty to heavy duty loads. Used in pairs, they press-fit into the wheel hub. Precision ball bearings (standard or stainless steel) for light or heavy-duty applications can be provided for both radial and thrust loads.